‘The view is amazing,’ says Andrew Croome as he rearranges the furniture. We’re in the upstairs studio where he worked on his most recent novel, Midnight Empire. The view is indeed amazing: from the studio’s place at the base of Mount Majura there’s the stillness and quiet of Canberra’s well-heeled northern suburbs, the low-lying landscape border of O’Connor Ridge, and the Brindabella ranges beyond, which this afternoon are dusted in snow. Driving here to interview Croome I couldn’t help realising – yet again – how peaceful this part of the world actually is, and beautiful, despite the fact that it’s been raining and sleeting for much of the day. On this dear old Earth of ours could there be a more serene city? It’s hard to imagine. Furniture now rearranged – Croome is adamant that I should have the comfortable bucket-style armchair – and voice-recorder set to play, we get to talking. 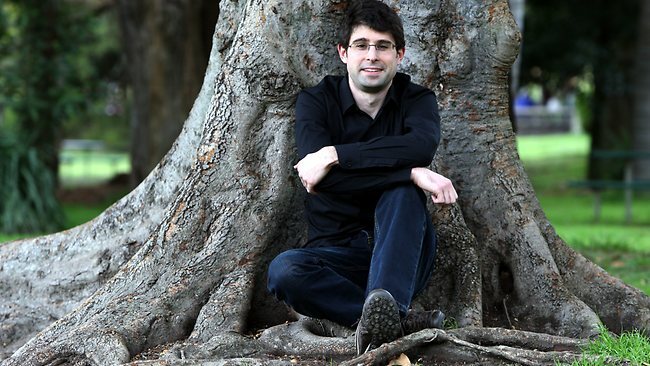 In publicity photos, this young Australian novelist looks like a character from the nerdy TV show The Big Bang Theory, but in person he is handsome, albeit in a boyish way, and has a thick and expansive 5 o’clock shadow that looks as if it’s been transplanted from a much older man. And his clear and thoughtful way of speaking seems to come from a much older man too, as though he’s been around the world a few times, and by the sounds of it he has, in his fiction at least. It is one of those extraordinary qualities of Canberra that we have in our midst a writer of Andrew Croome’s calibre. Described by publisher Allen & Unwin as a ‘Cold War historical novel’, Croome’s first book was Document Z which examined the Petrov affair, something else peculiar to the ACT. For Croome the book won the Australia/Vogel’s Literary Award in 2008 and the University of Technology Sydney Award for New Writing at the NSW Premier’s Literary Awards, and was short-listed for the Commonwealth Writers’ Prize for Best First Book and the Ned Kelly Award for Best First Fiction. In 2010 Andrew Croome was named a Sydney Morning Herald Young Novelist of the Year. If all this isn’t enough, Croome has a PhD in Creative Writing from the University of Melbourne, which examined the relationship between fiction and history (perhaps our federal politicians should have a read and learn a few things). Somewhat surprisingly, Croome’s way of speaking isn’t overly academic or highfalutin, just concise and logical and appealing, a lot like the way he writes. 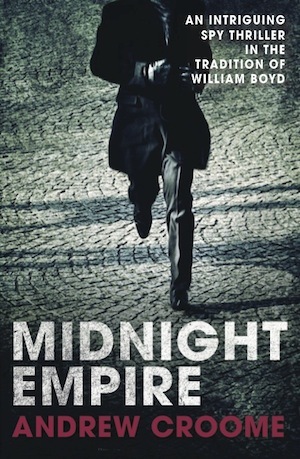 The main character in Midnight Empire is Daniel Carter, an Australian computer programmer whose Canberra-based software company sends him to work at the drone program run out of the Creech Air Force Base near Las Vegas. There he spends his days observing pilots flying unmanned but very definitely armed airplanes over Pakistan and his nights playing poker in the casinos, all the while forming a relationship with a woman without a history. It is an elegantly structured and chiselled narrative that follows Carter as he makes a series of mistakes that will have dire consequences for more than himself. In Midnight Empire poker forms a strong contrasting narrative thread. Wanting to know more about Andrew Croome the human being, I put forward something Canadian novelist Margaret Atwood once said: ‘Heartland is the part of the writer that the reader gets to know well.’ At first, Croome appears flummoxed. ‘What’s that mean?’ he says, before – thankfully – settling into a smile. I reword the question: What part of him should the reader connect with? Our interview finished, Andrew Croome leads me downstairs to the front door. He asks about my own writing – like many novelists it’s possible that he’s more comfortable asking the questions. We shake hands and he wishes me well. A minute later I’m driving out of Canberra’s Inner North suburbs. Even though it’s only 7pm, the streets are dark and largely deserted. I drive past the Australian War Memorial and the turnoff to the defence complex tucked behind the back of Campbell, and past the Royal Military College, Duntroon, and, a little later, past the turnoff to the Joint Operations Headquarters south of the pretty rural village of Bungendore. Quite suddenly I’m struck by the thought that, as Midnight Empire points out so frighteningly, this neck of the woods in the future might not be as peaceful and tranquil and serene as it is now. It may well become a place where people get up in the morning and kiss their partners and children goodbye and spend the next twelve hours destroying targets and killing people on the other side of the globe via robots in the sky. As Andrew Croome says, we will cross paths with these people in our supermarket queues and in the neighbourhood pub. For parts of the United States of America, this is happening right now as you read these words. We should thank our lucky stars that a novelist like Croome is living amongst us and asking the hard questions. And entertaining thousands as he does so. Wow, some intense thoughts there at the end. Thank you for sharing such an in-depth post/interview. Love your writing!